I hope you enjoy this issue of NewsLinks. This is NAEO’s publication to our members to bring you insight on how to program features within Infinity and Intelligent Series (I.S. ), peripherals (such as Ultracom and e-Response), inspirational messages, upcoming events and other relevant content we hope you and your office find useful. We have an outstanding committee of dedicated individuals helping to keep everyone in the loop of what is happening within NAEO. We have actively been updating the NAEO Facebook page on a daily basis. We are working on revamping NAEO’s LinkedIn account — and in the very near future, we will add a Twitter account as well. While NewsLinks has been on hiatus for a few months, we are geared to publish it on a monthly basis, moving forward. Our goal is to keep everyone within the NAEO community as informed as possible. I would like to thank the contributors to our NewsLinks articles, as we wouldn’t be able to create the content we have without their help, support and dedication. 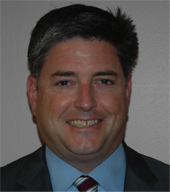 These individuals include Michael Goumas (Answer First), Kevin Procter (Extend Communications, Inc.), Gary Blair (Image 24) and David Drenk (Amtelco). If you or someone in your office has a talent writing articles, using Social Media or has a knack for communication in general, please consider joining our committee (or any committee within NAEO) as this is a great way to get involved! Most programming environments and languages feature debugging tools. Some feature a trace capability, allowing the programmer to see the code execute in "real time". Others feature break points where code will execute up to the point where the programmer has deemed code should stop or pause, allowing the programmer to then examine memory values to ensure all is as expected — or to debug the software if the values in memory contain an unwelcome surprise. Other languages have few, if any, debugging tools and require the programmer to be creative in this respect. IS scripting falls into this category, as there are no real debugging tools defined for use by the IS programmer. So what is an IS programmer to do? First of all, when debugging, we need to know where we are when the script is executing. This can be done by turning on screen descriptions, which will display the description field set on each screen. Yours truly always puts the screen name into that field — it makes things much easier to find when you're on a bug hunt. Also, with most bugs hiding in memory, it is important to view memory and see if you can track down when it changes. Enter the “prompt user” control. This little gem will pop up for you, indicating where you are, and you can use it to display any values in memory. Just add the fields you're watching to the prompt display. When that line of code is executed, you'll be shown the value in memory. Placing several of these prompts throughout your script can go a very long way to understanding when, why, and how memory values are changing as the code executes; and, like a trail of breadcrumbs, it can lead you to find the solution to a problem. Just remember to remove all of those prompts before you put the script live. Debugging prompts are not very helpful when taking messages. As programming is a creative process, so a programmer is a creative person. This is a very good thing, as finding a way to a solution often requires very creative thinking, and IS programming is no exception. There are other creative ways to debug an IS script — this writer will leave those for you to uncover, and to create all on your own. This is a newer feature of IS starting with 4.2. It has the ability to do many things. You can have the system schedule tasks that you don't want an operator to have to remember to do, you can have "sub-processes" that work in the background that is separate from main scripts, you can have the system determine choices whether or not you need a background process to go to an operator (mainly in my case inbound email or inbound SMS). At AnswerFirst, we test our email process (both inbound and outbound), our SMS process (again, both inbound and outbound) and our faxing capability (both again) every hour. Originally, our supervisors had to go in and pre-schedule using a script every time they wanted to set a time to schedule. Then when the scheduled time came due, our supervisor had to run the tests. Next, with any inbound emails or SMS messages from the tests, an operator had to go in and close those messages. And finally, they have to report (using the script) whether everything is up or down and what was down if something was down. With MergeComm, the MergeComm job is scheduled every hour to run. It automatically runs at the appointed time and auto-fires the tests out. That is all well and good for the first part. The next part in MergeComm is receiving the faxes and SMS and auto-delivering them when received. The emails are monitoring both eResponses, so an operator is still needed for those. But the eResponse receipts and the supervisor getting the script 20 minutes later to tell us that whatever is up or down is all the operator involvement needed. AnswerFirst processes quite a bit of unsolicited email for clients in the form of inbound jobs for our clients via the email channel. Many of these clients tell us that we need to ignore emails during certain times of day, or maybe if a subject line has specific words, or maybe evenif the body has some information. Currently with eResponse, no matter what, the email needs operator involvement. With MergeComm, all of the above ignoring of messages can happen in the background and the script decides what needs to go to an operator. This keeps your Waits clean of unnecessary “calls” when all the operator had to do was click a button to accept the email. It also removes the need for eResponse as everything is now handled by the IS Server. One thing I disliked was the Cues in the Infinity scheduler and the ability for the operator to just F4 the Cue and you have lost all of the information that was in the Cue. If that was a one-off Cue, you really have lost the information unless you can see Printer Capture. If it was a recurring Cue it is easy to look at the schedule. However, I don’t like it that the operator can press F4 and all of the information is gone. With MergeComm, you can now schedule the "Cues" in the IS Scheduler (using MergeComm Job) and create an IS message with a dispatch. The message can be as easy as giving instructions on what to do, or you can go with a full-fledged IS script that walks the operator through the "Cue". This way you cannot lose the dispatch. The operator needs to consciously close the dispatch with the script. There are more ways that I have not touched yet — and one of them is the AutoDispatch process. MergeComm is a resource saver (labor) and can make the system much more intelligent without having to go to an operator first. Many of us have to deal with unsolicited emails that we must react to and pull information from a huge block of text that is pertinent to contacting the person on-call and/or have your script make decisions based on the information. When I talk to clients, I have them send me an email so that eResponse, and now IS, can retrieve it so I can analyze the email and also have something to actually test from. Problem: I need some help. This can be parsed easily. In fact, I insist on a format like this. I explain to the client that once subjection is placed in the operator's hands, the opportunity for error can exist. Here is how you can parse this using IS. First you define the first label, Company:. Next you define the second label, Address:. I do include the colon ( : ) because it makes the information unique. Then I find first character after label 1 in the body of the email and also the start of label 2. Everything in between is the information that I need. The first ParsedName is the actual parsing of the Company field. The second one is to replace the CR/LF with spaces. The actual parsing using the line above is reusable. If you notice, it is exactly the same after each time I am defining Label2. The only difference in the 3 sets is the name of the field, ParsedName, ParsedPhone and ParsedPosition. The second line afterwards changes CR/LF (new line/paragraph) to a space. I do this in case there are multiple lines of information for a particular label. Come join us for a preview of what to expect during the 2016 IS Summer Series. Register now! Continuation of IS Contact Based. Sign up today to see and learn more about contact based dispatching architecture working on real accounts. Register now! From August 8-10, 2016, NAEO's Professional Development Committee is offering an exclusive, three-day hands-on training seminar on Intelligent Series Programming. The Embassy Suites Hotel (Philadelphia airport) is hosting this amazing event for commercial and medical answering services, hospital switchboards, and contact centers. Speakers include industry experts Marie McGuire of AnswerTel, Michael Goumas of AnswerFirst, and Amtelco trainers Michael Quimby and Jordan Beale. Whether you are new to Intelligent Series or looking to cross-train coworkers and build a programming department, you’ll learn first-hand, invaluable knowledge to efficiently and consistently program or convert your clients into Intelligent Series. 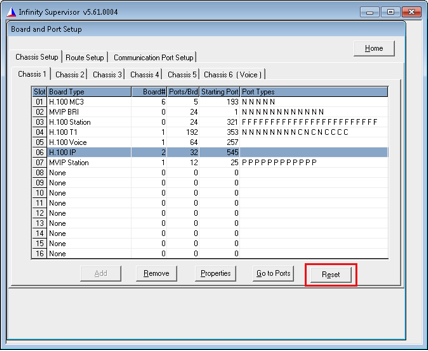 Reset buttons and a Clear SMS button on the Board and Port Setup pages of the Infinity Supervisor application enable supervisors to reset modems, to reset Amtelco XDS Technologies Voice over Internet Protocol (VoIP) boards, and to clear pending Short Message Service (SMS) jobs. The Reset button on the Communication Port Setup page is used to reset a modem. The Clear SMS button on the Communication Port Setup page is used to reset an SMS modem and clear pending SMS jobs, including pending replies. The Reset button on the Chassis Setup pages is used to reset an Amtelco XDS Technologies VoIP board in the Infinity host server. To reset a modem, open the Infinity Supervisor application. The Board and Port Setup window is displayed. Click the Communication Port Setup tab. The Communication Port Setup page is displayed. Select the modem that you want to reset. If the modem was reset successfully, the message "Modem reset successful" is displayed in a dialog box. To reset an SMS modem and clear all pending inbound SMS messages, open the Infinity Supervisor application. The Clear SMS button is available when an SMS modem is selected on the Communication Port Setup page. Select the SMS modem that you want to clear. Note: Clearing the SMS modem will clear all pending inbound SMS messages. Any SMS replies that were pending will not be received if the modem is cleared. If you are certain you want to clear the pending inbound SMS messages, click the Clear SMS button. 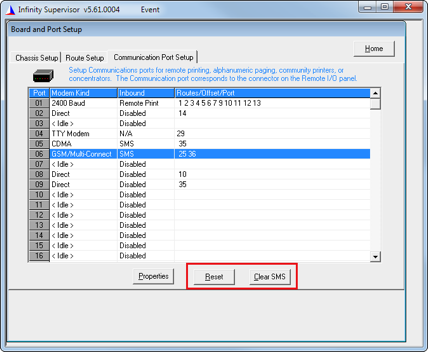 If the modem was reset and the pending jobs were cleared successfully, the message "SMS modem reset successful" is displayed in a dialog box. To reset an Amtelco XDS Technologies VoIP board, open the Infinity Supervisor application. Click the Chassis Setup tab if it is not already selected. The Chassis pages are displayed. The Reset button is available when an XDS Technologies VoIP board is selected. Select the board that you want to reset. Note: Resetting the VoIP board will drop all audio connections on the board, including operator audio and inbound calls. If you are certain you want to reset the VoIP board and drop all audio connections on the board, click the Reset button. If the reset board command was sent successfully, the message "Ports on board successfully reset starting with port: nnn" is displayed in a dialog box, with nnn replaced by the starting port number. The actual board reset takes about 45 seconds to complete. When the reset is complete and the VoIP board is ready to take calls, two system events are generated. In the first system event, Infinity sends the date and time, "VOIP Network," the port, duplexing information, and the speed. In the second system event, Infinity sends the date and time, "VOIP Address," the IP address, and the mask. 11/09/2015 09:51a VOIP Network port 0, Full Duplex 1000 mps. Amtelco has developed an Intelligent Series (IS) module that integrates the Infinity eResponse application with Intelligent Message scripts. The module consists of an IS script that takes a URL generated by eResponse and uses it to pull message information from an eResponse email message into an Intelligent Message. The script also is able to launch a web browser to display attachments. 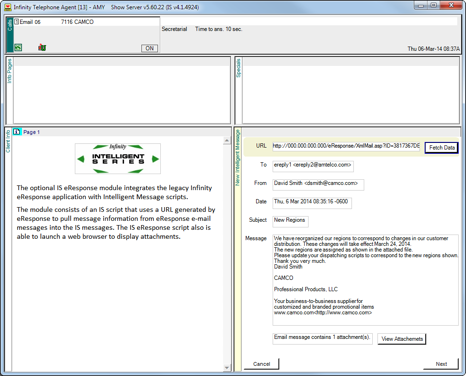 The Infinity eResponse application retrieves email messages and presents them to operators as calls governed by the Infinity ACD. eResponse can be used to enable a call center and its customers to publish email addresses with a guarantee that they will be responded to within a short time period. eResponse also can be used to enable staff members to confirm receipt of email messages and other tasks. When a new email message comes into the eResponse email address, a new call with the type of "Email" is presented to an IS agent. When the agent answers the call, a customizable Intelligent Messaging script is launched. 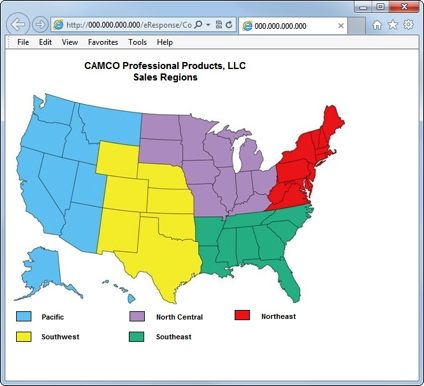 The script, provided with this module, takes a URL provided by eResponse and uses it to retrieve the recipient address, sender address, date and time, message subject, and contents of the email message. This information is stored in the message script fields so that the agent can read the information and save the information as an IS Message. If the email message contains any attachments, a "View Attachments" button is displayed. The agent can click the "View Attachments" button to display the attachments in the agent’s local web browser. 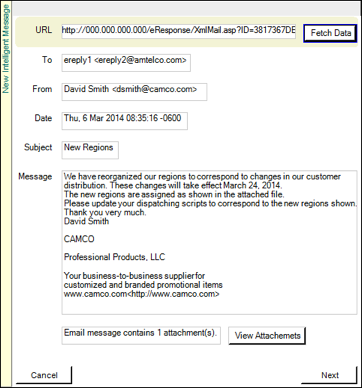 If the email message contains multiple attachments, the agent is presented with a picklist from which to select attachments to view. The IS script provided with this module is fully customizable, just like other Intelligent Messaging scripts.